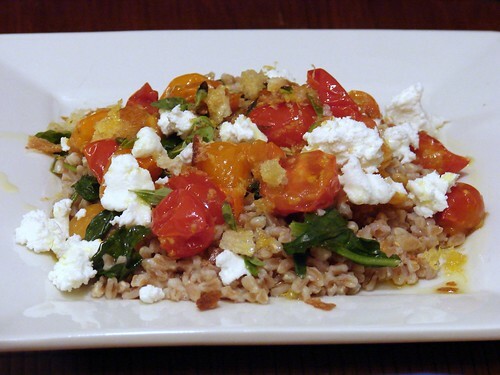 This here is a plate of farro, gently steamed Cooks Valley Farm spinach, melted Wishing Stone Farm cherry tomatoes with Zephyr Farm green garlic, a healthy hit of lemon juice and zest, some good olive oil, a crumble of Blue Ledge Farm goat cheese, and a sprinkling of crispy homemade herb and lemon breadcrumbs. Summer’s coming, and I love that we’re entering the time of year when I can make a fast and satisfying weeknight meal from a simply cooked grain, a load of vegetables and herbs from the farmers’ market, and a judicious amount of good quality fat and protein. i can’t get enough melted tomatoes!